My best friend Scott has just started blogging. He's also a good friend ov Vic over at Darth Apathy. Go check out his new blog, Vulture's Row. He's even tried his hand at ranting. Nicely done -- beginner's luck. >and was for distribution of all wealth. She felt deeply ashamed that her father was a rather staunch Republican which she expressed openly. had to be the truth and she indicated so to her father. have many college friends because of spending all her time studying. That she was taking a more difficult curriculum. Her father listened and then asked, "How is your good friend Mary doing?" She replied, "Mary is barely getting by." She continued, "She barely has a 2.0 GPA," adding, "and all she takes are easy classes and she never studies." "But Mary is so very popular on campus, college for her is a blast, she goes to all the parties all the time and very often doesn't even show up for classes because she is too hung over." Her father then asked his daughter, "Why don't you go to the Dean's office and ask him to deduct a 1.0 off your 4.0 GPA and give it to your friend who only has a 2.0." He continued, "That way you will both have a 3.0 GPA and certainly that would be a fair and equal distribution of GPA." The daughter visibly shocked by her father's suggestion angrily fired back, "That wouldn't be fair! I worked really hard for mine, I did without and Mary has done little or nothing, she played while I worked real hard!" The father slowly smiled, winked and said, "Welcome to the Republican Party!" 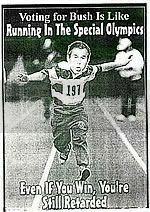 If you can't read it, the caption reads "Voting for Bush is like running in the Special Olympics -- Even if you win you are still retarded." Very nice. This from the Party of PC Language. I'm sure they didn't intend to mock the special Olympics while simultaneously mocking the President -- of course, I only give them the benefit of the doubt because I don't think they were capable of thinking it all the way through. Either way, it's pretty sad. As one of my readers has said, "It's like the Limbo Dance!" It's been a while since I've blogged on the nasty tactics of the Left to intimidate conservative voters. So let's talk today about the nasty tactics of the Right to intimidate liberal voters. Infuriating. But not too surprising. I've said all along that the things those on the Left scream loudest about are usually the things of which they're guilty themselves. I'm curious to see where this leads, but won't get my hopes up. 7 AM: Heading to work, temp is in the low 50's, maybe the 40's, I've got my jacket on. 5 PM: It will be in the high 60's or 70's, and I'll be sweating. Hot or Cold, Mother Nature. Make up your mind.